Sat nav systems have been a feature of Britain’s roads for a number of years now, helping drivers find the easiest and quickest route to their destination. It’s a major shift from the way we used to navigate our roads, with fewer and fewer drivers taking a physical map along on their travels. Despite this, it wasn't until December 2017 that drivers first received specific training to teach them how to safely use a sat nav. Now, however, the majority of candidates in England, Scotland and Wales take practical tests which feature a sat nav. Read on to learn more about how these changes might affect you. It wasn’t all that long ago that motorists had to rely on A-Z guides and road atlases to navigate their way across the country. A little over a decade ago, however, sat nav systems exploded onto the scene, revolutionising the way we got around. Sat navs have since become ubiquitous: in 2015, 52% of drivers used sat navs, using a mixture of in-built systems, standalone devices, and smartphones. 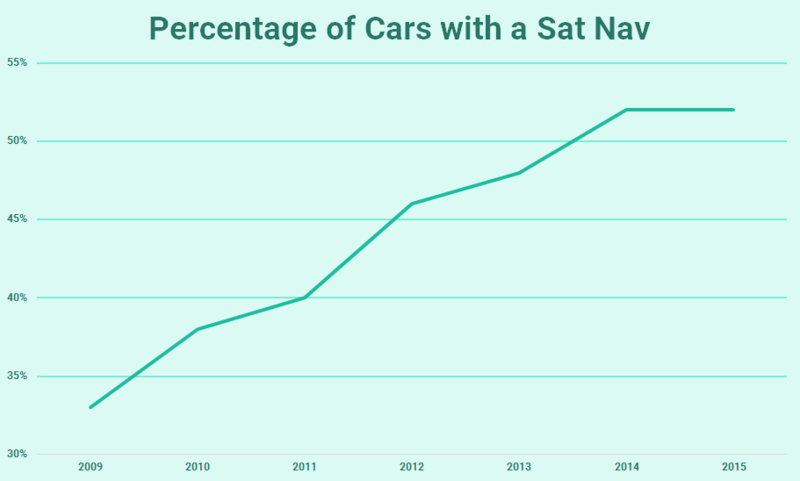 It’s a figure that’s increased significantly over recent years; as recently as 2009, only a third of cars had a sat nav. From a driver’s perspective, it’s easy to see some of the advantages of using a sat nav. No longer is there a need to pull over just to double-check your map (or to rely on a passenger to check directions). All you need to do is put in your destination before you set off, and you’ll be guided to your route automatically. Should you veer off from your original planned route, the software will detect this and reroute you in a matter of seconds. There’s also no need for you to constantly purchase new guidebooks as new roads and buildings open and destinations change over time. Sat navs generally come with lifetime updates as standard. This means that you can get up-to-date information with a simple download, ensuring you’ll be able to stay on the right track. Some devices also alert drivers when they’re around an area where they need to pay extra attention—such as roads next to schools—helping to prevent some accidents. While sat navs have made drivers’ lives more convenient in many ways, they’ve also introduced new hazards. In a survey conducted by road safety charity Brake in conjunction with Direct Line, 7% of drivers admitted to having had a near miss (either having to suddenly swerve or brake to avoid a hazard) because they were distracted by a sat nav. These figures rose amongst younger drivers, 11% of whom claimed to have been distracted by sat navs. This is particularly worrying when considering the fact that an estimated 22% of crashes may be caused by driver distraction. Distraction isn’t the only issue: 15% of sat nav users make illegal or risky manoeuvres to correct mistakes when following sat nav instructions. Meanwhile, in 2008, it was even estimated that sat navs had already caused around 300,000 accidents on UK roads. Sat navs are now a common feature of our roads, and they’re here to stay. Nonetheless, it’s clear that many drivers aren’t aware of how to correctly use a sat nav, leading to them getting distracted whilst on the road, committing dangerous driving faults, and posing risks to themselves and other road users. Ensuring that new drivers are using sat navs safely is crucial. Today, road collisions cause a quarter of all deaths amongst 15–19-year-olds; the biggest killer of young people. The inclusion of sat navs in driving tests aims to reducing the number of road collisions, taking into account the way we drive today. 80% of candidates in England, Scotland and Wales will use a sat nav on their test. They’ll feature during the independent driving section of the practical test. During this section, candidates will need to follow directions from a sat nav. You won’t be able to bring your own sat nav—this will be provided by the examiner, who will also set the device up. Don’t worry about making a mistake or missing one of the directions. The test isn’t assessing your navigation abilities; it’s about ensuring that you can safely use a sat nav without getting distracted. It’s okay if you end up going the wrong way—the important thing is to avoid making any driving faults. This section of the test will last for 20 minutes. Four in every five tests will involve the use of a sat nav; in the remaining fifth of tests, drivers will have to follow traffic signs instead. What other driving test changes were made? For the full details, check out our guide to the driving test changes. With the test changes now in force, you will need to take your test under the new rules—but there’s no need to worry. PassMeFast’s range of intensive driving courses gives you a great chance of passing first time. We offer manual and automatic driving lessons, cover a wide range of practical test centres, and have high pass rates. Our fleet of DVSA-approved driving instructors have the experience to help you ditch your ‘L’ plates in no time—and we can even help beat standard DVSA waiting times by weeks thanks to our fast-track practical test service. To learn more, check out our blog, visit our guide to crash courses, or simply get in contact with us—we’re happy to help!